I always assumed there was a complicated secret to making sticky toffee pudding. I had never attempted it and was sure it would be messy and annoying to prepare. But, this is exactly the kind of dessert I love: a tender cake with chewy dates, a buttery toffee caramel sauce, and some whipped cream for serving. It also happens to be a classic dessert for colder weather since the cake and sauce are served warm. I decided to throw caution to the wind and give it a try for Christmas dinner, and now I’m wondering why I thought this was going to be so difficult. The cakes are easy to make in ramekins. The sauce was a simple mix of ingredients that simmered on top of the stove. And, whipping cream and toasting walnuts for garnish isn’t too hard to do. The recipe I used is from Lost Desserts by Gail Monaghan. Some of the desserts in the book are less lost than others. There are things I’d never encountered before like Siedel Torte, Pruneaux au Pichet, and Crepes Verlaine. Then, there are more familiar although somewhat old fashioned things like Carrot Cake, Baked Alaska, and Schrafft’s Famous Butterscotch Sundae. I’m certain that sticky toffee pudding isn’t one that’s lost because I ordered a delicious version of it at King’s Highway at the Ace Hotel in Palm Springs last May. I guess that was also proof that it doesn’t have to be served in cold weather. At any rate, it does make an excellent dessert for Christmas or any other special wintertime meal. 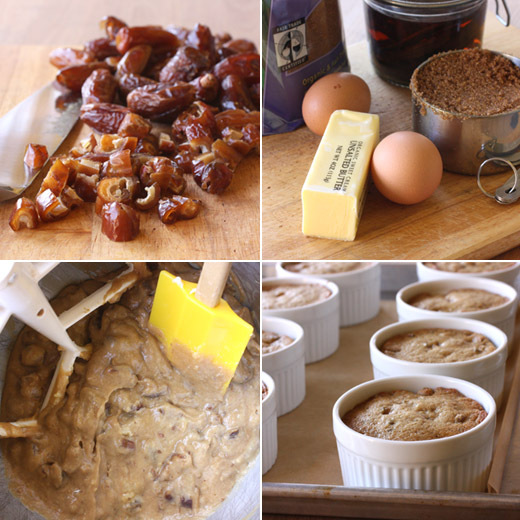 To start the cakes, or puddings, you chop the dates and remove the pits as you go. They were then covered with boiling water, and vanilla, instant espresso powder, and baking soda were added. Eight ramekins were buttered and the oven was preheated. In a stand mixer, softened butter and granulated sugar were creamed, and eggs were added. Flour and baking powder were sifted together and slowly added to the egg mixture while mixing. Last, the date mixture was folded into the batter, the batter was divided among the ramekins, and the puddings baked for 20 minutes. The cooled puddings were removed from the ramekins and stored on parchment in an airtight container. They can be made in advance and refrigerated or even frozen. For the sauce, brown sugar, butter, salt, and cream were combined in a saucepan and brought to a simmer. Once the sugar was dissolved and the sauce thickened a bit, it was ready. This step could also be done in advance, and the sauce can be refrigerated and reheated just before serving. When it was time for dessert, the broiler was set to high. The puddings were placed on a baking sheet and topped with some of the sauce. The sheet pan was placed several inches under the broiler, and the puddings were warmed until the sauce was bubbly. The puddings were transferred to serving plates, topped with more sauce, and garnished with whipped cream and toasted walnuts. Obviously, I was delighted with this dessert and could have eaten the sauce by itself with a spoon, but still, there seemed to be not quite enough sauce since I ended up making a second batch to serve with the leftover puddings the next day. This is no place to skimp on buttery, caramel sauce. And, I’m delighted to find out how wrong I was about making them. They’re easy enough to whip up again whenever I want. 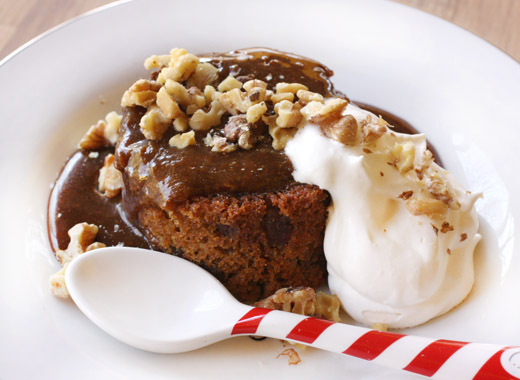 I love sticky toffee pudding, it's such a treat! Your photos are gorgeous, Lisa! Hope you're having a fabulous start to your New Year. A devilish treat! Your puddings look amazing and ever so tempting. lisa, Happy New Year!!! wishing you all the best. Several year ago my daughter insisted we try Sticky Toffee Pudding. She liked the idea of sweet dates in the moist cake. We were not disappointed! I do like the addition of whipped cream, what a stunning dessert! Happy New Year Lisa! That looks gorgeous and what a pretty spoon! Oh, my gosh... Lisa, I've ALWAYS wanted to make this dessert, and like you, I never did for fear it would be too complicated, messy, too much trouble. YES!!! Sticky Toffee Pudding is my all time favorite and I only get it at restaurants once in a blue moon. So glad you posted this. The one thing that's kept me from making it is that my whole family is all chocolate all the time. But I realize now, that's just the beauty of it. More for me! This looks divine. Can't wait to make. such an enticing dessert! sounds scrumptious and i adore that striped spoon in the photo! Such a great dessert! I've eaten this, but never made it. Why have I been wasting my life? I need to correct that right away! Good stuff - thanks. I've never actually made Sticky Toffee Pudding but I enjoy it immensely especially during the colder months when there is a nip in the air. Thanks for putting my mind at ease - they look quite straight forward to make! Happy New Year, Lisa! And I'm the same - I always thought Sticky Toffee Pudding was so complicated but you make it look easy and so temptingly delicious! And the cookbook sounds like a must-have! Wow! That is one gorgeous pudding! It really is a perfect cold-weather dessert. Sticky toffee pudding is one of those classic desserts that I always WANT to make but it just never seems to be the right occasion. Obviously I just need to do it! I didn't realize that such puddings were so easy either.... That's dangerous knowledge for me. Wow. I don't know that I've ever had sticky, toffee pudding. Must remedy that soon. Hope you had a terrific Christmas dinner! I'd love to try this - it's such a festive dish! 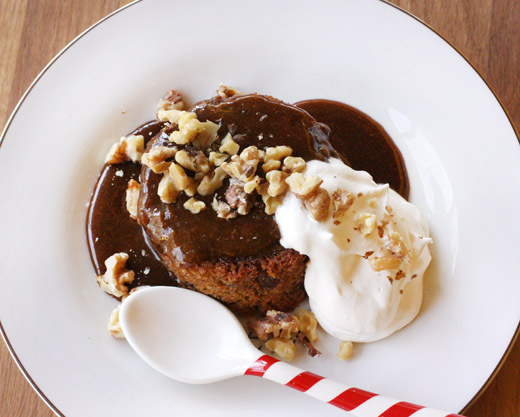 I have a bag of dates left from Christmas and these puddings would be the perfect way to use them up - delicious, Lisa!